I spent about 1h trying to disable Cortana on windows 10. Open PowerShell ISE as administrator. To do that, search "powershell_ise" in the search box of the start menu (should still be Cortana), and right click on the shown result, selecting "run as administrator". Enter this command in the shell to enable script execution: "Set-ExecutionPolicy -ExecutionPolicy Unrestricted". Enter this script on the script tab, and save it as "disablecortana.ps1" somewhere. New-Item -Path "HKLM:\SOFTWARE\Policies\Microsoft\Windows" -Name "Windows Search"
Run the script clicking on the run icon above the script area. That's it. If you feel lonely and you want Cortana back, just change "-Value 1" in the Set-ItemProperty line. As anticipated previously, I have been thinking at how to put the Falcon project back on track, after more than two years of pause. Here's my plan. It has been a while since I was able to properly dedicate time to developing Falcon as I wished to. I have been forced by circumstances to be reserved, so I could not share much of my ideas, or about my life, in this blog or anywhere else. Which, in the era of social network, equates more or less to social death. And finally, I am in Kyoto, the "Capital City". Differently from Nara, this city was built to be useful rather than beautiful. Set up as fast as possible, in 10 years, there was no time to make it the aesthetic marvel Nara. What they build was big, functional and effective. And notably, without a single Buddhist temple around. After a few years after the foundation, two well regulated temples were added at the beginning of the main road. The Imperial Citadel was at the opposite side of the City, at the northern end like in Nara, about four kilometres away. As a result of this practical design, its plant staid basically unchanged for one thousand years. While all buildings have changed, the city is still basically organized in a rectangle long five kilometres and a half in the north-south direction and four and a half east-west, and divided in blocks by streets that still carry the ancient names, from the Ichijou (first branch) cutting the city right south of the Imperial Palace to the Juujou (tenth branch) at the far south border of the town. The fatigue of the past days asks its toll today, and I am willing to concede a bit of rest to my body: I wake up around 10am. With three hours at disposal less than usual, it will be a day less packed than the other ones, but it's fine. My first target is the the ruins of the Imperial Palace. 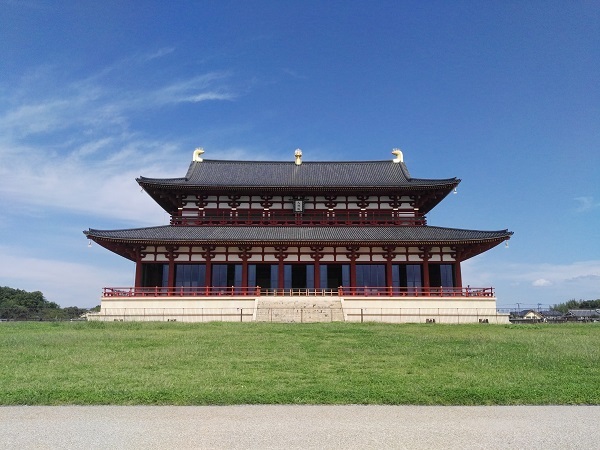 Once in the middle of the city, it's now at the extreme western edge, and getting there is not a simple thing at all, especially considering that the public transportation in Nara is... sub-par... I'd say... with respect to the other cities I visited. So, I get there walking, under the scorching sun of an end of September that hits harder than the August sun in most of Italy. 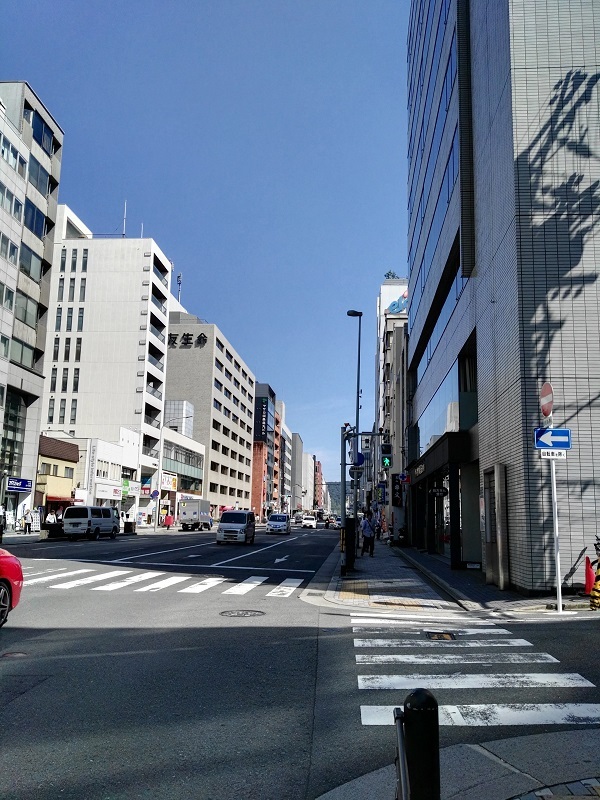 It's about 40 minutes walk from my hotel, which is more or less at the far end of the road leading to the temples, the main road crossing the commercial center, but it's a nice walk and I am fresh. I expected to see nothing, or at best a few faded landmark posters, but I am wrong. The Nara Prefecture is actually rebuilding the site with an attached cultural center and one museum. Those are still under construction, but the majestic main gate, the Throne Hall and vast sections of the wall are there waiting for me, so brand new they still smell of fresh paint. For those who know Japanese, this sentence can't mean anything but "nothing but deers!" 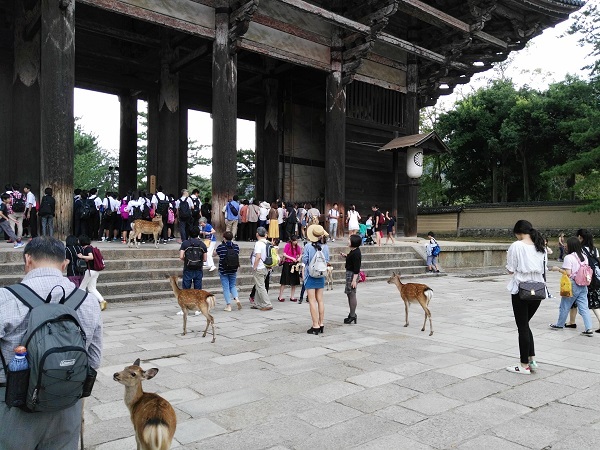 Nara is famous for the presence of a countless number of deers in the eastern side of the city, once the public gardens that were part of the original plan of the city, now extended to comprise all the area of the temples and part of the surrounding mountains. 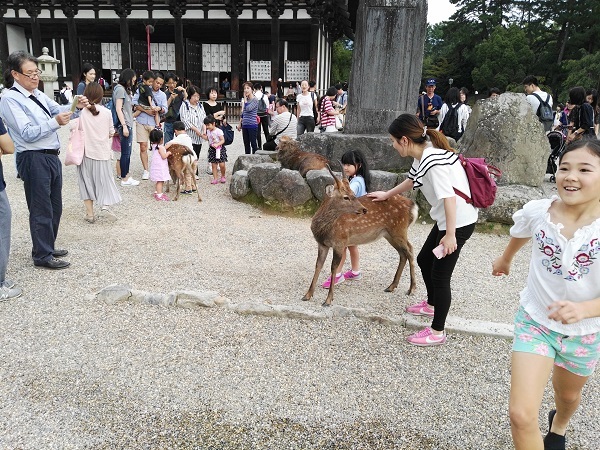 Yet, seeing this wild and usually very shy animals going around the town poking at tourists for the (regulated and controlled) deer-biscuits you can buy for 200 yen in a pack of five, is always a bewildering sight. Most of them also seem to like being petted, especially by the children, which the younger deer seem to actively be searching for, even if they rarely, if ever, get a biscuit from them. 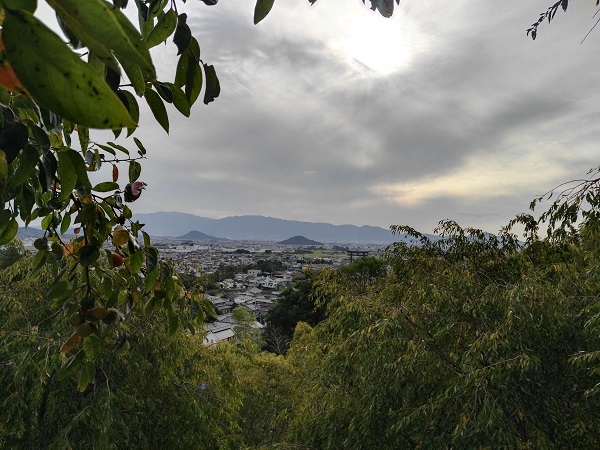 Before talking of my sojourn in Nara, I want to describe why it's so interesting to me. When it was founded, Nara was probably the most beautiful city of the time in the whole world. The first city in Japan, and one of the first in the world, to be planned in every detail, it's building would span for about 16 years, to be completed in 710 C.E (in the meanwhile the Capital was temporarily set in the home town of the Fujiwara clan). A square of roughly four kilometers per side with its north side gently lying against a hill ridge, its east side protruding in another sub-city one kilometer and a half comprising the temples of all the faiths active in Japan at the time, lying its eastern border on the slope of the Wakakusa mount, with many gardens, small hills, natural and artificially reshaped streams running through its border, Nara would have looked an image of a celestial town to any visitor. 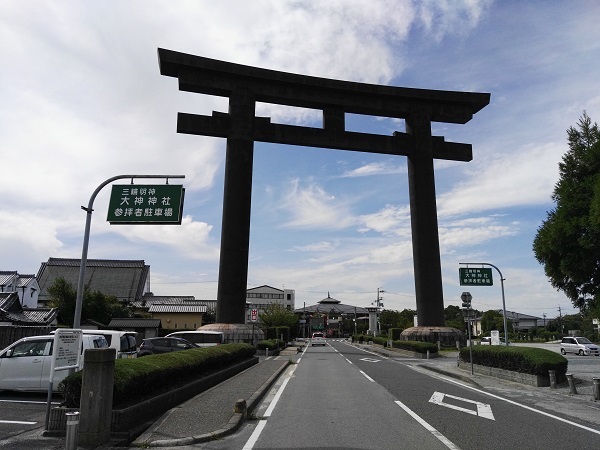 Under the famous "Hashi Haka" (*), the tomb of the chopsticks, so many mysteries have been buried, that opening and studying it might actually destabilize the political asset of Japan, or at least, rewrite most of its early history. This is the reason why this tomb will never be opened, at least, not in the near future. While the tombs where members of the Yamato family are buried are considered private property of the Emperor, and trespassing their borders is equivalent to violate a private house, this tomb officially belongs to a aunt of an Emperor, which might not have been strictly part of the immediate emperor's family and ancestry. But even if he position of this person in the royal family is unclear, too many secrets are buried under this tomb for it to be opened and investigated lightly. And that's why it intrigues me. And so, I have finally reached Asuka. After climbing the Sacred Mount Miwa I am a bit too tired to do anything but driving directly to the hotel and my head is filled with nothing but the image of the onsen waiting for me, but I cannot prevent my self from wondering at the feeling of ancientness this land immediately gives me. It's not just because of the road signs indicating a different Emperor's mausoleum, ruins, archaeological site, historical temple at each cross. It's not just that here, if you drive a stick one feet in the ground chances are that you'll be hitting an archaeological find. 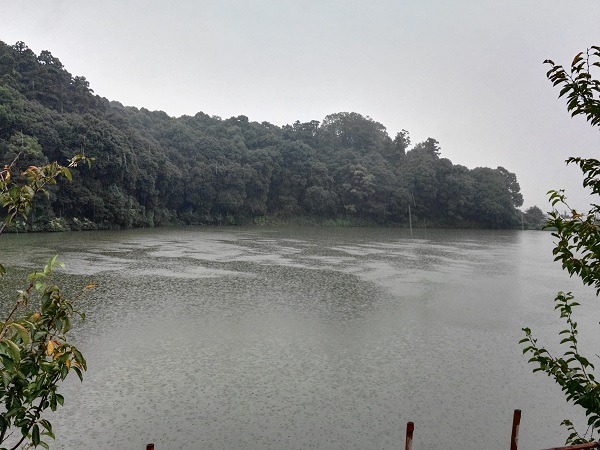 If there is a group of humans in the range of 100 kilometers from this place, they will move here and make this the center of a powerful civilization. And indeed, that's what happened, as traces of the Yamatai people were found moving out from Awajishima and occupying this land around 300 B.C.E. Right after leaving the Hase temple, I head for the shrines of the Mount Miwa. Or better, for the Mount Miwa, which is itself a shrine, and for countless other shrines which derive their power from the sacred mountain. Even today, it is forbidden to enter it, but the priests of the Miwa Shrine complex can grant access to a specific path leading to a special shrine on the top. Placed right in front of the center of the mount, at the right distance and in the right proportions to "enshrine" it, this monument declares the mount as a sacred entity itself. It is said that the mount is the shintai (true embodiment) of Oo-mono-no-nushi-no-mikoto, or "The Master of the Big Things", and it's the most important God and Kami (I already explained the difference) after Amaterasu-no-mikoto -- and probably there was a time in which it was even more important. Indeed, the shrines on the mountain, taken one by one, are smaller in "ground size" than the Ise Jingu, but they are way richer and more elaborate, functionally more complex (in the sense that they always had more "room" for teaching and worshiping the Way of the Kamis), and taken together, they fill a larger area.